Yesterday's late selloff was something that many chart readers might view as ugly on a chart. My research has shown quite the opposite. When SPY has closed near the bottom end of its range but still positive on the day that has generally been a good thing. 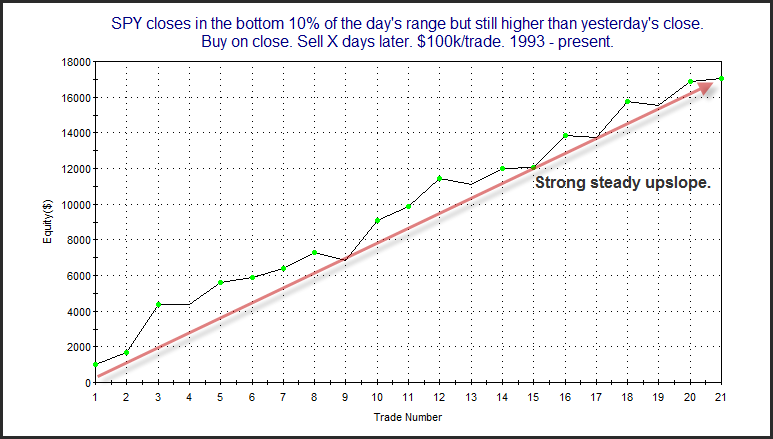 Below is a simple study from last night's Subscriber Letter that exemplifies this. Tuesday's close brought us to the next extremely strong seasonal period. The last 2 years I have shown the "Twas 3 Nights Before Christmas" study. I've have updated it again below. How many instances are needed when considering study results? This post is the 2nd part of a series I started a few weeks ago that will discuss using quantifiable edges to your advantage. Today I'll discuss a common question I get about the studies. How many instances are needed for valid and usable results? It will lead into "What makes a study compelling?" in the next post. Some studies are fairly general. For instance, I might look at how the market performs after it has traded down 3 days in a row. Others are more specific with added filters. Perhaps I notice that not only is the SPX down 3 days in a row, but it also is trading at a 10-day low, and is above the 200ma and volume has increased each of the last 3 days. Both studies could tell me something about the market in relation to its current condition (assuming I’m describing current conditions, which is typically my approach). 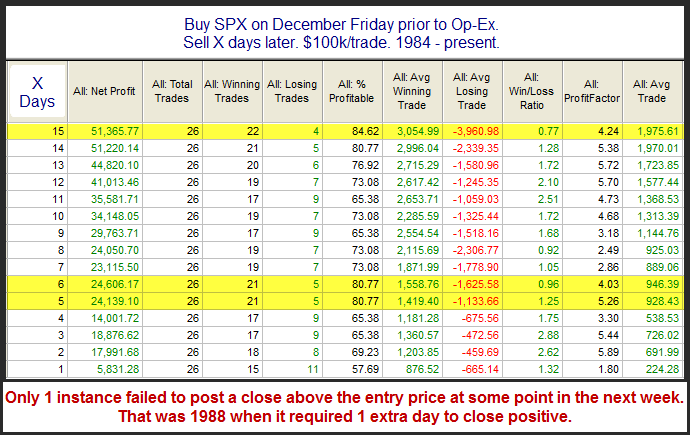 If I am able to describe conditions that more closely match the current market then I have a better shot at seeing behavior over the next several days match up with the study results. Of course there is a trade-off between general and specific, and that is the number of instances. A general test may have hundreds or thousands of instances which it can refer to in order to generate expectations. A very specific test may have an extremely low number of instances. If the number of instances is too low then the results may have little or no meaning. For instance if my parameters are run and I find that the market had only set up in a similar manner 1 other time over my test period, is it reasonable to assume that the market will act the same way this time? Most people would correctly assume “no”. What if there were 2 instances and they both had similar reactions in the past. Could I assume this suggests a directional edge? 3 instances? 4? 10? 30? 50? More? How many instances is “enough” to have some level of confidence that your results are actually suggesting an edge and they are not the result of luck? Before answering let me address 1 common misconception people have about statistical testing. That misconception is that you need 30 instances in order to demonstrate statistical significance. This idea originates in the fact that a sample size of 30 is needed in order to calculate a Z-score or run a chi-square test. The reason that 30 instances are necessary is that Z-scores assume a normal probability distribution. Without 30 instances it is not possible to resolve the shape of the normal probability distribution clearly enough to make certain statistical measures valid. 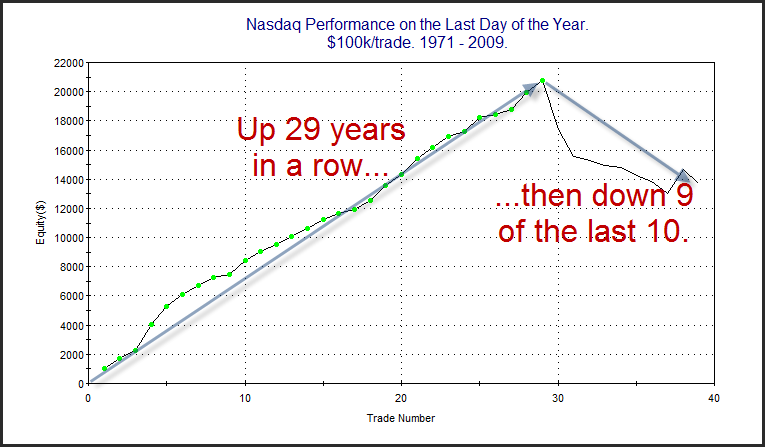 One thing traders should be aware of is that the stock market does not have a normal distribution anyway. It has “fat tails”. In other words, there are more outliers present in stock market movements than one would expect under a normally distributed curve. So relying on standard statistical measures and assuming a normal distribution could expose a trader to more risk than his results would imply. Still, these tests are helpful in determining whether your results were likely due to a real edge or whether there is a high risk that luck played a big part. But what if you don’t have 30 instances? In that case you could use a t-table statistic. Note that this post also contains a t-table. One interesting thing we can see when looking at a t-table is the minimum number of instances you would need to have different confidence levels that your edge is actually an edge and not due to luck. For instance, if all instances were followed by a market rise, you would want at least 6 instances in order to be 95% confident that there was an actual edge. 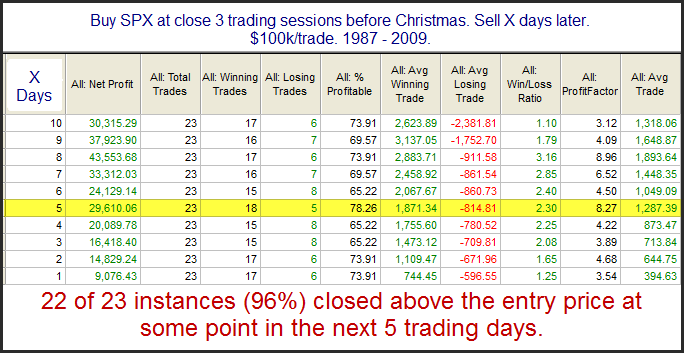 A 99.9% confidence would be reached if you had 11 instances that all resulted in a rise over the next X days. So if you look back at the study I showed Wednesday, SPY only set up in that pattern 12 times in the past, but every time it was trading higher 5 days later. This means statistically there is about a 99.9% chance that the positive results were due to more than luck. That there has in fact been a real edge in that pattern in the past. Does this mean there is a 100% chance it will be higher 5 days after the setup? No! Not even close. A high degree of confidence means there is likely some kind of an edge. It doesn’t mean the past winning % or net expectations are likely to persist indefinitely. So how many instances do I require before I’m willing to accept a study as part of my analysis and place it on my active list? It varies depending on things like the strength of previous reactions and other stats I’ll get into in my next post, but I’ll generally use a t-table to help me decide. Will I incorporate a study with only 10 or 11 instances? Yes, but it will have to have strong win/loss stats and a high win %. Personally, I tend to favor studies that have somewhere between 20-70 instances. Too low and they are less reliable. Too high and the setup is often too broad to have much meaning. I’ve spent far more space discussing this than I wanted, but it is an issue that has come up time and again with readers, so I wanted to be somewhat thorough. In fact, of the list of things I look at in a study to help me decide whether it is compelling or not, the number of instances (assuming it isn’t minuscule) is near the bottom . I intend to accelerate this series of posts over the next couple of weeks and I’m sorry it’s taken so long to get rolling. In the next post I will discuss a list of other things I examine when determining whether I find a study compelling. Only 12 instances but the results are overwhelmingly positive. In last night's Subscriber Letter I shared some additional details, including all the dates. There are actually a very large number of studies I am currently monitoring. They are somewhat mixed. This particular study makes a compelling arguement for a short-term bullish outlook. If you'd like to trial the Quantifiable Edges Subscriber Letter a free trial is offered here. If you have already trialed it but not in the last 6 months, you may request another trial via email to support at QuantifiableEdges dot com. The Traders Expo will be held at the Marriot Marquis Hotel in from February 20 - 23, 2011. I've decided to make the trip. I'll be speaking on the 21st from 1:30 - 2:30pm. I'll be discussing some of of my favorite research and trading ideas. I hope to have the opportunity to meet severall blog readers and subscribers at the event. I'm generally seeing a mix of bullish and bearish studies right now. Friday's blog is an example of an active bearish study. This one certainly favors the bulls. Declining volume at new highs can often lead to short-term difficulties. Below is a study related to SPY and SPY volume that I've shown a few times in the Subscriber Letter. It popped up in the Quantifinder again on Thursday. 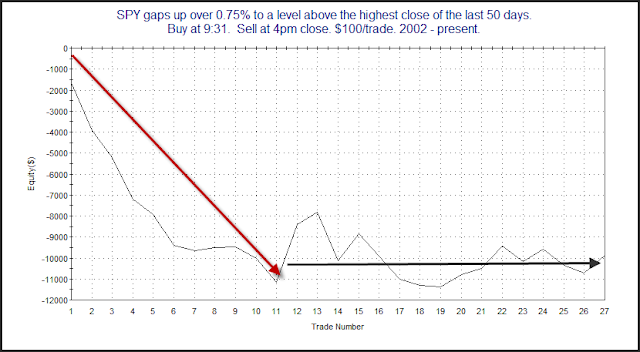 I've shown in the past using numerous studies that a large gap to a new high has a tendency to pull back during the day. Below is a study that represents some of what I was looking at this morning. Last week on the blog I showed an indicator that measured the amount of POMO stimulus the Fed has injected into the system over a 1-month (20 day) timeframe. As a review POMO stands for Permanent Open Market Operations and it is how the Fed goes into the open market to buy (or sell) treasury securities. The net effect of this buying is an influx of cash into the system. It appears a portion of that cash makes its way through the banking system and into the stock market. It also appears that the net effect of all this Fed buying is a positive influence on the stock market. Today I have updated the chart from last week. The top panel shows the S&P 500. The indicator on the bottom is the total POMO buying in dollars that the Fed has done. I've zoomed in to just show the last year and a half. 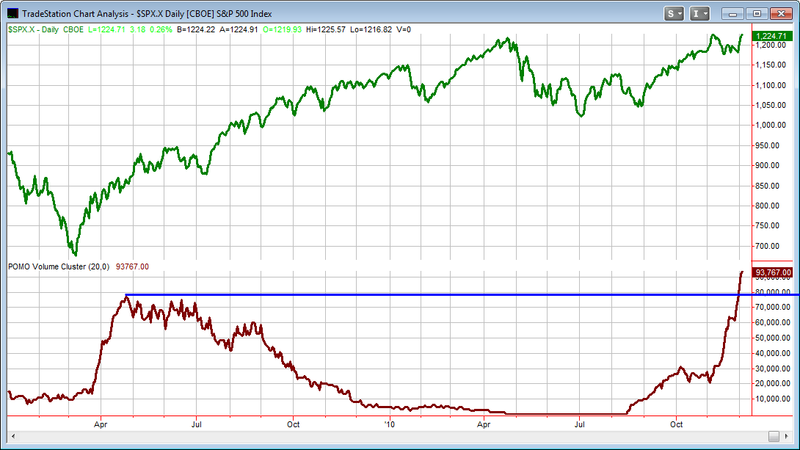 As you can see the POMO buying over the last month has now far exceeded any 20-day period in 2009 (or ever). According to the Fed's website Mon-Thurs of this week are also scheduled for POMO activity. And a new schedule is due out on Friday so there is a chance we'll continue to see strong Fed buying in the weeks ahead. Evidence suggests to me that this should have a bullish influence on the market. Last night in his video "Gap Guy" Scott Andrews took some interesting looks at gaps that occured on the 1st day of the month. Of course since he posted it early he couldn't have known we were about to get such a large gap up. 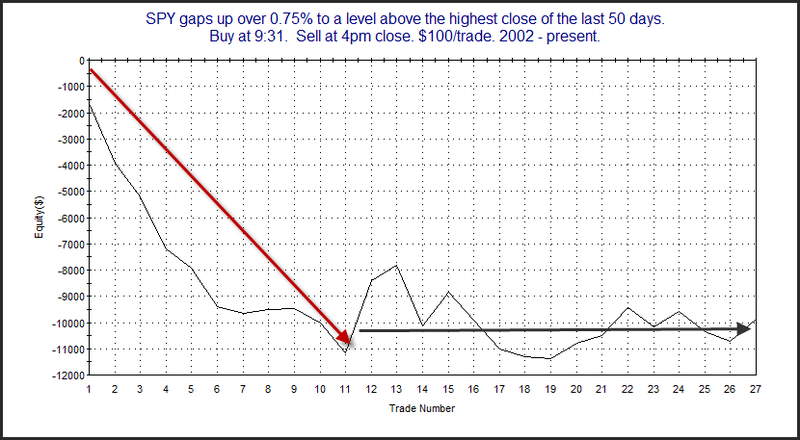 Inspired by Scott I took a look at other 1% gaps that occured on the 1st day of the month. I've listed all instances below.